The launch of Renault Twingo Gordini 133 in Europe brings a luxury car with the Gordini 'signature' to the light car segment. 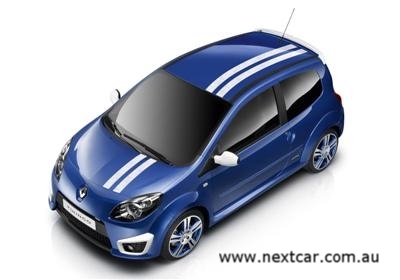 Developed by Renaultsport, this stylish small car exudes the spirit of Gordini, with a modern twist. 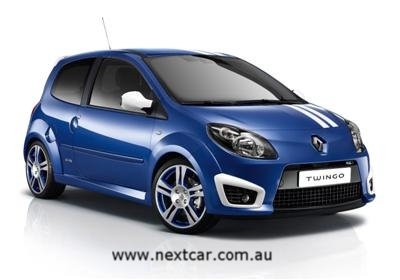 Twingo Gordini 133 features a Malta Blue metallic finish with twin white racing stripes, in keeping with its famous predecessors. The front and rear bumpers are enhanced by gloss black centre sections, while the fog light surrounds, door mirrors housing and rear spoiler are all highlighted in a contrasting white finish. This exclusive exterior styling package is completed by 17 inch Gordini alloy wheels with a polished face and black inner rim. The same Gordini spirit continues inside thanks to Renaultsport seats with extra lateral support clothed in dark grey leather with blue details and Gordini-embossed logo. Blue detailing continues on to the door panels, the gearlever gaiter and Gordini-badged gearknob. The steering wheel is finished in blue and dark grey leather with two white stripes to indicate the centre point, whilst the rev counter pod is also in blue with a white face. Customers can personalise their Twingo Gordini 133 with optional Pearl Black paint instead of Malta Blue, the Cup chassis (lower ride height, stiffer springs and dampers), Gordini wheels with a blue inner rim, curtain airbags and an electrically-operated panoramic sunroof (no roof stripes when fitted). Amédée Gordini, who developed almost 200,000 Renault vehicles over a 20 year period, achieved some of the brand’s greatest sporting achievements. Born in 1899, within a year of Louis Renault building his very first vehicle, Amédée Gordini was fascinated by automobiles and motor racing from a very young age. After working as a racing mechanic in his teens, Gordini developed his own sports racing and Grand Prix cars before being engaged by Renault in the mid-1950s. The Renault 8 Gordini with its bright blue paintwork and twin white stripes was one of his most successful and iconic cars, finishing 1st, 3rd, 4th and 5th in the 1964 Tour of Corsica rally. In 1966, the 1,300 cc version heralded the Gordini Cup one-make race series and the blueprint for all single-make motor sport championships.